Use these free printable baby shower invitation templates to make quick and easy handmade invitations. I've included several different templates for your budget friendly needs. There is an arts and crafts template for creating quarter fold and side fold cards, for those with more of a hands on, crafty approach to cardmaking. The arts and crafts templates are also fabulous for kids craft projects as well. 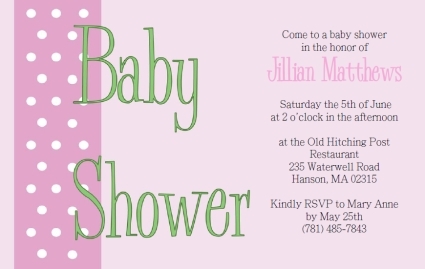 Making homemade baby shower invites is a great opportunity to get big sis or big brother involved in welcoming the new baby! Also included are some customizable PDF file templates. These interactive, printable invitation templates allow you to change the wording, fonts, font size, alignment, and even the text colors. 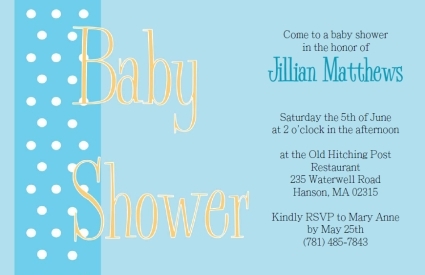 Great for an inexpensive and personalized baby shower invitation. What could be more inexpenzive than a freebie? 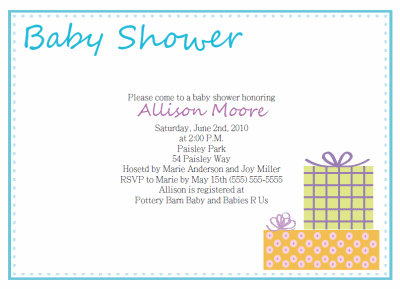 These free printable baby shower invitation interactive templates are easy to use. Just download and open the file in Adobe Reader. Highlight the text you wish to change using the text tool, and press "control" and "e" at the same time. This will bring up a tool palette in which you can use to change the fonts, font sizes, alignment, font colors, etc... Simply type your new invitation wording and change it to suit your style and needs! After you have made the sufficient changes to the file chosse "save as" from the "file" menu, and then change the name of the file. Print it onto some heavy cardstock or nice paper, and use our handy cutting guides to cut the invitations down to 5" by 7". Use them as is, or take it a step further by attaching them to some fancy paper or colored cardstock backing. Add glitter, rhinestones, or ribbon! Our arts and crafts template is a printable pdf file only. You cannot change or add any text to this file. It is great for creative cardmaking or kids crafts. It is a text only template, so you will need to jazz it up a bit. 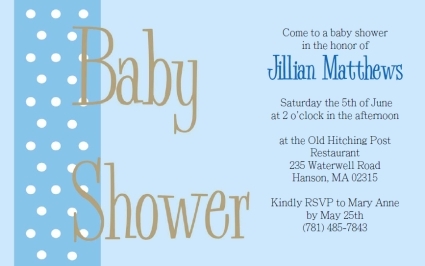 I did this quite intentionally so that the same template could create many different baby shower invitations. 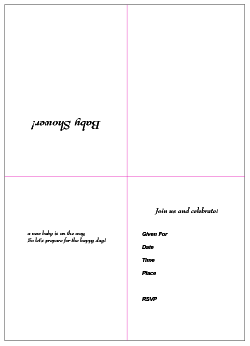 Using this template you can create either quarter page fold invitations or standard side fold cards. To create a quarter page fold invitation simply print onto the 8 1/2" by 11" paper of your choice and then fold it into quarters. Decorate the front of the crad and hand write the details for your party onto the inside! To create a side fold card, print the template onto 8 1/2" by 11" cardstock. Print the template back to back (on both sides) so that each side is opposite from each other. Cut the paper in half and simply fold the cards in half. Decorate them and write your party details within the inside of the invitation. Use your imagination! Get creative! Try printing it onto different kinds of paper and adding ribbon or cloth embellishments! You can create graphics on the front by adding stickers or pictures! Make them any way you want them!! You will need Adobe Reader (the latest version is recommended) installed on your computer in order to open and read this file.